Jabba, we feel ya. We know just what it's like to search years and years, and finally come across that single piece that just really ties the room together. But, we have to differ with you on this particular carbonite slab. You see, it does have Han Solo encased in it. And we kinda, sorta, need him back in the Rebellion to help save the day. So, we might have to stage a bit of rescue! 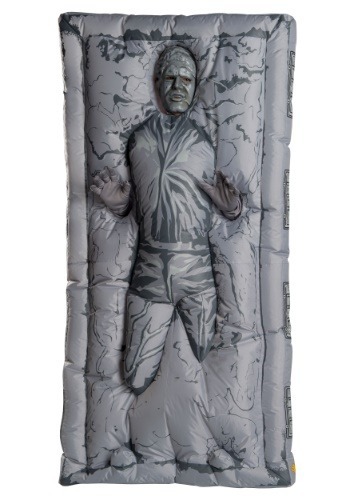 You, of course, can become Han frozen in Carbonite when you choose this Inflatable Han Solo Carbonite Costume. It uses a battery operated fan to replicate that carbonite block appearance, and it's even got a carbonite Han mask for you to wear so you'll look just like you're a frozen Han Solo. You, of course, won't actually be frozen. So you can party all you like. But, you will be able to team up with Boba Fett or your friend in a Leia/Boushh Bounty Hunter costume. Now that'd be one heck of a costume combination! You've probably already noticed, but we've got all the top styles of Star Wars Costumes. We do, after all, have the world's largest selection of costumes! And that means we've got styles to get all of your friends and family into the Star Wars fun. Assemble your squad, and whether you're heading to Jabba's palace or just the costume party down the street, we're sure you're gonna have a great time!